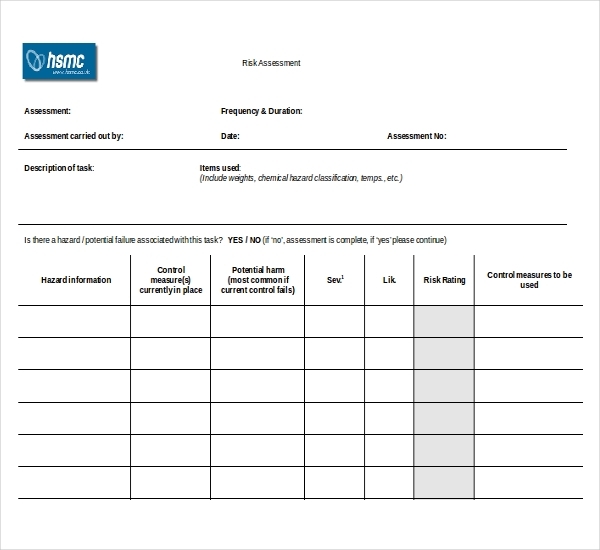 Project risk assessment form can be used by a structural engineer to assess a project. It outlines a methodology which will be used to qualitatively/subjectively assess a project’s risk. The approach is modeled after project risk assessment processes outlined in standard project management texts and training courses but tailored to the unique risks encountered in a specific project. Primary care providers use this form for Healthy Plan beneficiaries enrolled in Managed Care Plans only. Questions are mostly about your current health. Your doctor and your health plan will use this information to better meet your health needs. The information you provide in this form is personal health information protected by law and will be kept confidential. 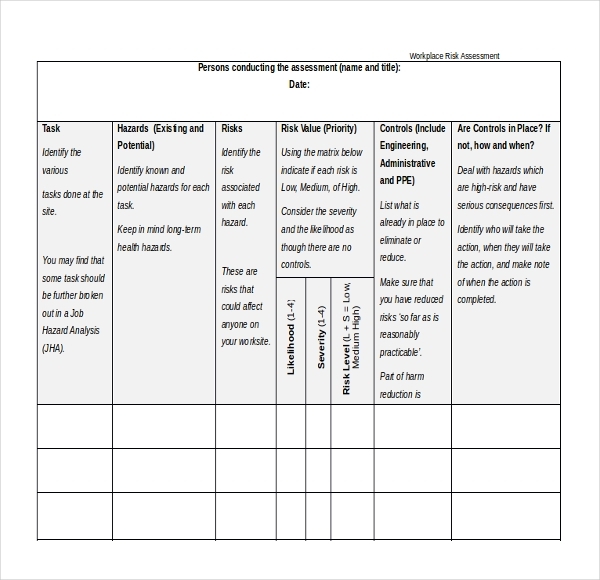 The basic risk assessment form can be used by anyone who wants to start a project. 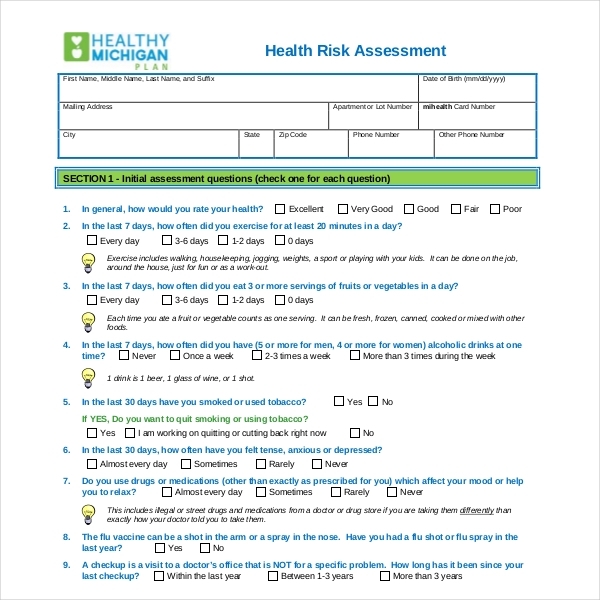 It gives one a general overview of risk assessment and helps one see what a risk assessment form is all about. 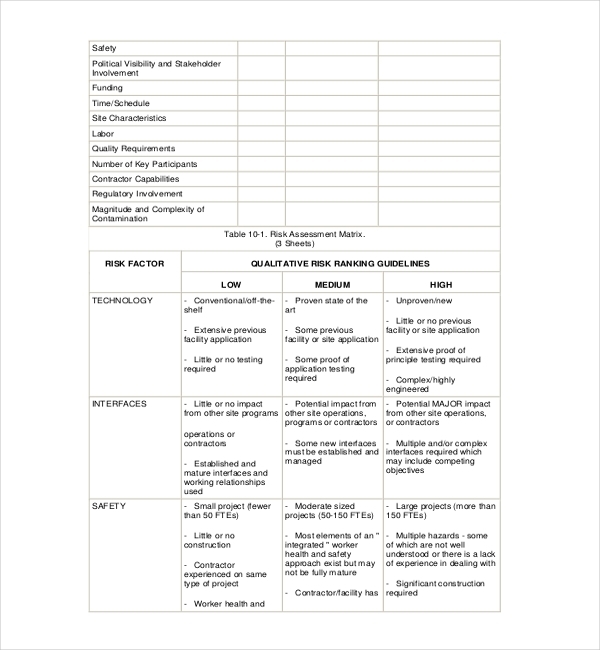 This form helps you identify some of the hazards in your project and the steps you need to take to control the risks. 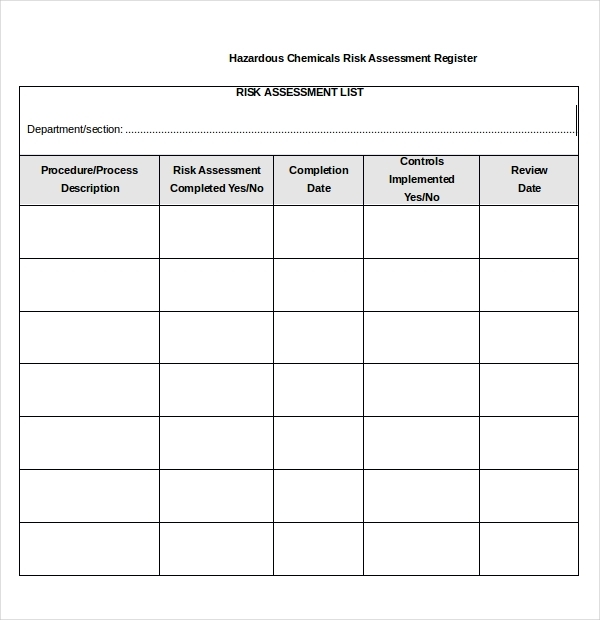 A chemical procedure risk assessment form must be completed prior to the start of any work involving hazardous chemicals. To complete a chemical procedure risk assessment the assessor must identify: all hazardous substances and dangerous goods used in the procedure, all hazards associated with the chemicals to be used, existing control measures, control measures required before work commences. The electrical risk assessment form gives a procedure is to perform electrical risk assessment, which includes a review of the electrical hazards, the associated foreseeable tasks, and the protective measures that are required in order to maintain a tolerable level of risk. This assessment should be performed by electrical engineers before work starts. 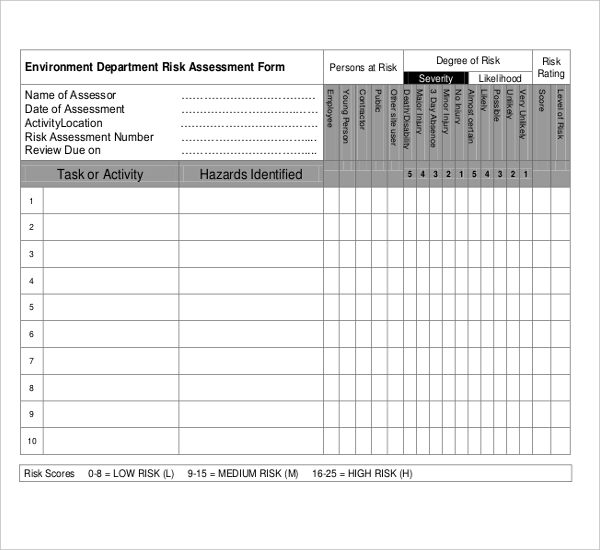 Environmental risk assessment form is used by environmental management organizations/bodies or project managers. It provides a systematic procedure for predicting potential risks to human health or the environment. The aim of this assessment is to investigate if a chemical is being used or can be used as intended without causing detrimental effects to human health or the environment. 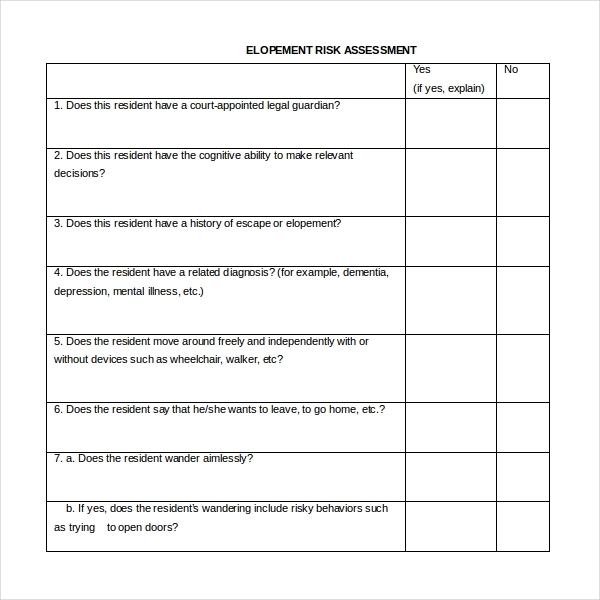 Elopement risk assessment form is used by nursing homes to determine if a resident has the safety awareness to remain in the facility, an objective, score-based risk assessment should include a defined parameter that indicates an increased risk for elopement and prompts the implementation of prevention strategies. It helps the provider to identify residents who suffer from cognitive deficits that result in poor safety awareness. 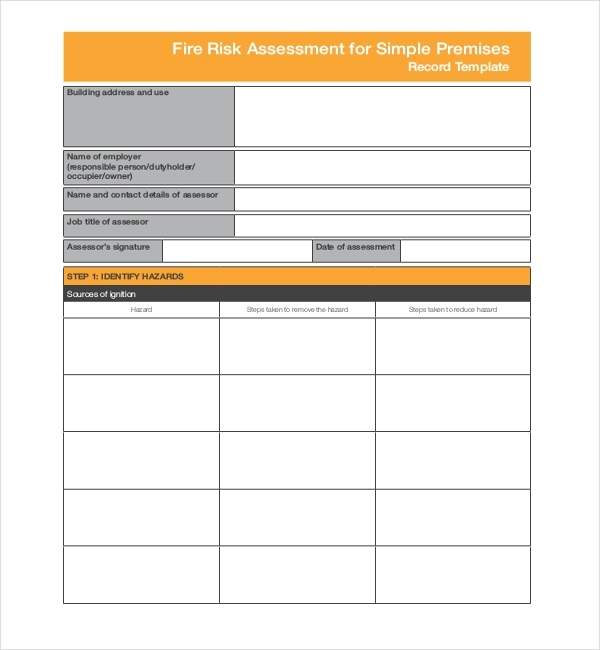 Fire risk assessment form template follows the preferred five-step method as recommended in guidance in support of the Regulatory Reform (Fire Safety) Order. Ideally suited for simple work premises, It helps one to record fire hazards, assess the risk and evaluate measures to reduce the likelihood of a fire. It is used by personnel rained to assess fire risk. 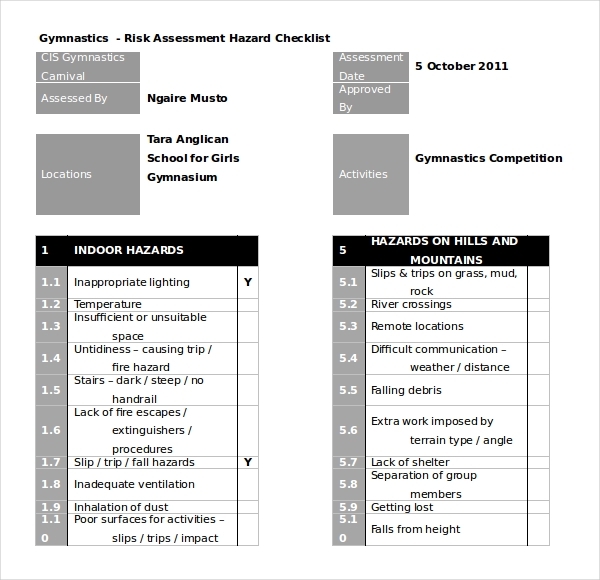 Gym risk assessment form is used by people engaged in fitness businesses. It helps one to identify and assess the significance of potential hazards in the delivery of exercise activities and programs. Prioritising the significance of each hazard allows the opportunity to address the most significant potential risks first. 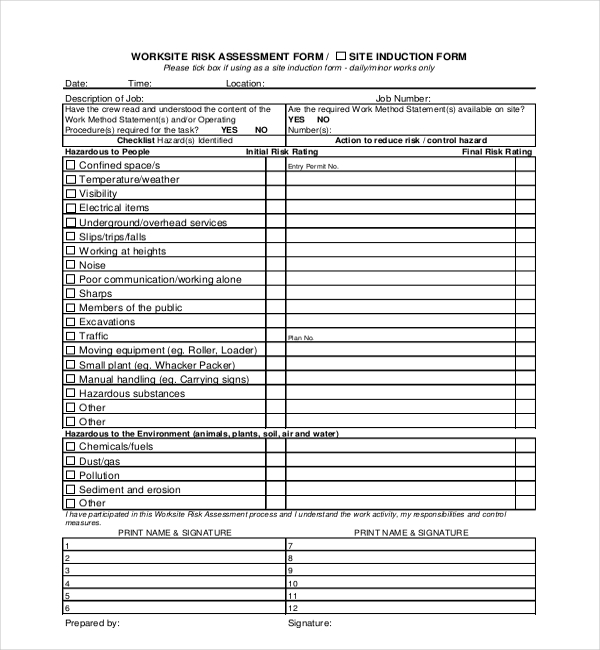 A job risk assessment form is intended for use by managers, supervisors, workers and joint health and safety committee members. It outlines the steps in a risk assessment and provides details on completing a job hazard analysis. Effective health and safety management is based on a universal understanding of risks and how to control them through good planning. Risk assessments are very important as they form an integral part of a good occupational health and safety management plan. It helps create awareness of hazards and risks. It also helps identify who may be at risk e.g. employees, visitors etc. It also helps in determining control measures.